A visionary $6 million gift to Vanderbilt University from the Eskind family will ensure that the Annette and Irwin Eskind Biomedical Library, the institution’s hub of medical information services and resources since 1994, will continue to support the next generation of scientists, physicians, students and patients. 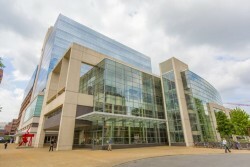 The $12.9 million renovation will provide infrastructure for the implementation of the innovative Curriculum 2.0 in the School of Medicine while accommodating the diverse needs of the Biomedical Library’s audiences from all 10 of Vanderbilt’s schools and colleges. 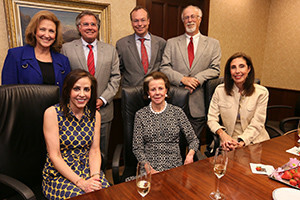 In an effort to enhance the broad functions of the award-winning library building, longtime Vanderbilt benefactor Annette S. Eskind and her two sons and their wives, Dr. and Mrs. Steven J. Eskind and Dr. and Mrs. Jeffrey B. Eskind, are making the gift to continue the vision of the late Dr. Irwin Eskind. “This library, and Vanderbilt as a whole, meant a great deal to Irwin. The training of the next generation of physicians and researchers was his passion,” said Annette Eskind. The renovation project is expected to be completed within 18 months, and the library will be renamed the Annette and Irwin Eskind Family Biomedical Library and Learning Center. Vanderbilt and the Nashville community have long benefited from the Eskind family’s philanthropy. The late Dr. Eskind devoted enormous personal effort to enhancing the resources of Vanderbilt University and Vanderbilt University Medical Center. In addition to the biomedical library, Dr. Eskind was instrumental in establishing the comprehensive Vanderbilt-Eskind Diabetes Clinic and the Annette Schaffer Eskind Chair at the Vanderbilt Kennedy Center. His sons jointly established the Irwin B. Eskind Symposium on Diabetes Care and Research in their father’s honor prior to his death. Dr. Irwin Eskind was a 1945 graduate of Vanderbilt University, a 1948 graduate of the Vanderbilt University School of Medicine and a longtime member of the Vanderbilt Board of Trust. He was a clinical professor of medicine, emeritus, at Vanderbilt and worked on the staffs of Vanderbilt and Saint Thomas hospitals.